If you’re currently expecting your first child, I’d like to first offer my warmest congratulations! You’re about to embark on the greatest adventure of your life, one filled with more love and joy than you ever thought possible. You will be forever changed by the tiny human you will soon hold in your arms. I recently gave birth to the cutest little guy. He joined my almost five-year-old son and two-year old daughter to complete our crazy family! He likes to cry more and sleep less than my other two children combined, but thankfully I have a little experience under my belt. Babies need lots of stuff and over the past few years, I have amassed quite a collection of all sorts of baby-related gadgets and gizmos. Today I’d like to share what I consider the most important essentials for surviving thriving with a newborn. You’ll definitely want to include these items on your baby registry! Not sure where to register? buybuyBaby is an excellent choice for creating your baby gift registry. They offer many wonderful features including 1-on-1 assistance with a Registry Consultant, 10% completion discount, a goody bag for the expectant parents, and many in-store and online resources to help you select products that are just right for your growing family! You’ve probably been planning your baby’s nursery as long as you’ve been pregnant. But if you’re like me, you’ll want your newborn close by at night so there’s a good chance they won’t sleep in their crib the first few weeks (or months!) of their life. My firstborn son slept in a play yard with a bassinet attachment. The Graco Pack ‘n Play is similar to what we had and now comes in a variety of styles with lots of different options to meet all your infant’s needs. (We now use the play yard anytime we travel so it’s a definite must on your registry!) When my daughter came along she had bad reflux and couldn’t sleep while lying flat on her back. A friend recommended the Fisher Price Rock ‘n Play, and I think it single-handedly saved my sanity! This lightweight, inclined sleeper can be easily moved from room to room in your house making it the perfect place for naps or nighttime sleep. The model I have has since been upgraded to include hands-free rocking and soothing songs and sounds, which can all be controlled from an app! For the first couple months of life, babies spend most of their time eating and sleeping. However, you’ll need a landing spot for the few moments your sweetie is awake and ready to play. I’ve recently decided that my two favorites are a swing and play mat. The Graco Duet Soothe Swing features 6 swing speeds, vibration, songs and nature sounds to keep your baby happy. This swing also has a detachable seat which doubles as a potable rocker. You can also entertain your little one with the Fisher Price Kick & Play Piano Gym play mat. Great for play time or tummy time, this adorable toy features bright colors and cheerful songs for lots of musical fun! Handmade, cotton, fleece and muslin…I have received countless blankets over the past few years. People seem to think they’re a great gift. Of all the ones I’ve been given, my absolute favorites are the aden + anais Muslin Swaddles. 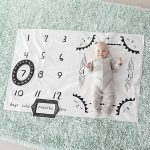 These large, lightweight blankets are available in many patterns and colors and work beautifully as a blanket or swaddle, as well as a car seat or nursing cover. If you’re planning to swaddle your newborn, I highly recommend the SwaddleMe wraps. I never quite got the swaddle technique down and my babies always broke out of their blanket which would cause them to wake up. SwaddleMe wraps are so easy to use. They have Velcro closures, ensuring your little one stays snug-as-a-bug and sleeping soundly. Five years ago I registered for a very basic baby bathtub which included a bath sling for newborns and I’ve used the same tub for all three of my children. My favorite feature is the sling which cradles newborns and keeps them in just the right about of water. The closest item I found to my beloved tub is the Fisher Price 4-in-1 Sling ‘n Seat Bath Tub which includes a newborn sling and is roomy enough for toddlers up to 25 lbs. There was only one new baby item I purchased before my newest little one was born- a Baby K’Tan. This soft, wrap-style carrier is lightweight, simple to use and perfect for cuddling with your newborn. I would also suggest registering for an Ergobaby Four Position 360 Baby Carrier which evenly distributes baby’s weight between your hip and shoulders, allowing you to effortlessly carry older infants and toddlers. The single most important piece of baby gear that you’ll need to select is a car seat. After all, they won’t allow you to leave the hospital unless you have one properly installed in your car! I’ve loved our Chicco KeyFit Infant Car Seat. It’s a cinch to put in or take out of the car and it’s held up well considering it’s been used by three babies. You’ll also want register for a convertible car seat to use once your baby has outgrown the infant seat. I suggest choosing a car seat that will last the rest of your child’s car seat days, such as the Graco Nautilus Elite which can be used as a 5-point harness seat, high back booster or backless booster and goes up to 120 lbs. I’ve purchased several different strollers over the past five years. If I were to do it all over again, I would register for a car seat carrier stroller like the Chicco KeyFit (which fits the infant car seat I mentioned above) to use during your baby’s first few months of life. If they fall asleep in the car, you can easily leave them in their car seat and simply move it to the stroller. In addition to the car seat carrier stroller, I would also select a lightweight stroller, such as the Graco Breaze, to use once they can sit up on their own. 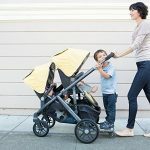 Alternately, if you’re planning to have more than one child within a few years, I would suggest splurging on a versatile convertible stroller or frame stroller such as the Baby Jogger City Select which is sold as a single stroller, but has 16 configurations to accommodate up to three children. You’ll definitely need to register for a diaper bag. The one you select is a matter of personal preference, but I recommend choosing one with lots of pockets and compartments such as the SKIP*HOP Forma Backpack. This stylish hands-free diaper bag includes those compartments as well as a cushioned changing pad, a storage tote and an insulated tote to help you stay organized on-the-go. I would also suggest registering the JJ Cole Diaper and Wipes Caddy to keep you organized at home. This handy dandy little box has a spot for diapers and wipes, as well as a little drawer that is perfect for storing rash creams, pacifiers, nail clippers, gas drops and more so that you’ll be prepared for all messy situations! For even more inspiration, check out our Pinterest board! This is just a short list of the must-haves for life with a little one. For a full list of everything you need to include on your registry, don’t forget to check out buybuyBaby’s Registry Checklist! 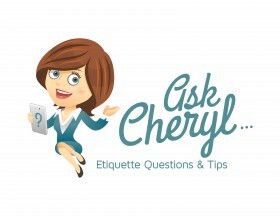 Ask Cheryl: Should You Have a Baby Shower for a Second or Even Third Child?